Nothing Sews Like a BERNINA - nothing! We are a full service dealership with a complete line of sewing & embroidery machines. Come visit our BERNINA department where you can sit down and experience what sets a BERNINA apart from the rest. It's true that nothing sews like a . Let our knowledgeable staff help you choose the perfect machine for your needs. When you purchase a from us you are entitled to mastery classes as long as you own the machine, a first year clean, oil, and adjust by our certified technician, and support from our experienced staff. If you want to start quilting your own quilts, our Quilt Motion Software and BERNINA Quilt Frame will provide you with all the freedom to create custom quilting designs or choose from thousands of available designs. Sew Many Quilts is the only Authorized Dealer in Bend, Oregon. We take pride in providing you excellent service. We're here after the sale to help you with all aspects of learning how to take advantage of all the capabilities of your sewing machine. is the only family owned sewing machine company in the world and it is a source of pride for them to maintain their reputation for quality. Nothing sews like a BERNINA - nothing! We sell many of our machines below MSRP. Come into the shop for the very best pricing that we can give you. We have a factory-trained BERNINA Technician on site to take care of your service and repair needs. 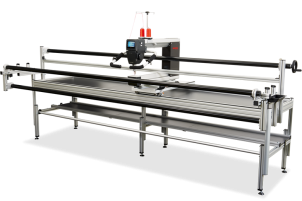 Click on the links below the machines to take you directly to the website for more information about the model you are interested in. Feel like just exploring the new exciting BERNINA website - just click here. Think Big and Dream Big as you enjoy all of the features of this wonderful quilting machine. Make your quilts truly yours from concept to completion. A long history of innovation blended with a wealth of quilting expertise is brought together in a machine that will meet the demands of discriminating quilters everywhere. From the first stitch, you will appreciate the thought behind every detail. Click here to learn more details about this wonderful machine. Would you rather have a sit-down quilting machine? 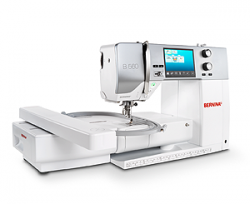 This Bernina Q 20 may be just the one you've been dreaming of. The basic table size is 43" x 47". It has a variable working height, and the same high quality machine head as on the frame models. Click here for more details. 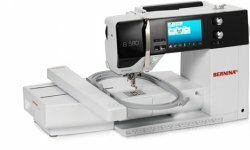 Enter the world of Endless Creativity with Bernina's top model with the most features for your highest comfort. Click on this link to take you directly to the Bernina 880 website. The B 880 includes a meticulously engineered extended freearm area with a full 12 inches of space to the right of the needle and five inches in height. With this extra large area, you’ll have the added benefit of a jumbo embroidery field, an extended space to expand your creativity. Bernina's newest series of machines. Featuring a new hook system that combines the best of two previous systems, a full 10" to the right of needle throat, bright touchscreen, and many, many improvements. 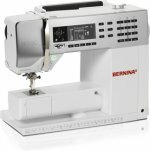 Click on a machine or number to go directly to the Bernina website for videos and complete information. Designed with your Creative Future in Mind. Click on the photo or name to go directly to the BERNINA website for complete information. BERNINA 3 Series - Function and design in one sewing machine. Click on the photo or name to go directly to the BERNINA website for complete information. The 1008 is a mechanical machine. Click on the photo or name to go directly to the BERNINA website for complete information. 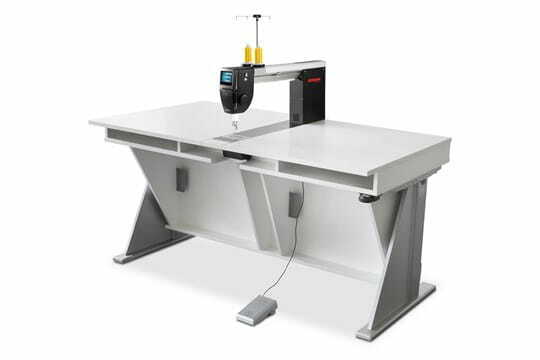 The new bernette sewing machines – young design at an affordable price. Click on the photo or name to go directly to the BERNINA website for complete information. Cut, sew, and serge in one step with these machines. Click on the photo or name to go directly to the BERNINA website for complete information.